Tony Howes graduated from UQ in 1983 with a degree in chemical engineering, and after 6 months working on a novel fluid bed retort system for oil shale went to Cambridge, UK, where he worked with Malcolm Mackley as his first PhD student on what is now the “Oscillating Baffled Reactor”. His dissertation was awarded the 1988 Danckwerts-Maxwell prize for best thesis in that year. A postdoctoral year at Brown University working on patterns in fluid data sets was followed by 3 ½ years in ICI’s Corporate Colloid Science Group, where he worked on theory and application of a novel atomiser. 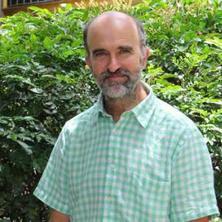 Since 1993 Tony has been at The University of Queensland teaching, supervising and doing research. His work (largely in collaboration with Bhesh Bhandari in Food Science) on sticky droplet spray drying has been extensively published and cited – at present Bhandari and Howes papers are in the top-10 most cited in Drying Technology, Journal of Food Engineering and International Journal of Food Properties. Tony has also worked on a variety of other particle problems, including solid state fermentation, regimes in rotating drums and prilling. Following work on sticky mud particles he was heavily involved in local water quality issues, and sat on the Scientific Expert Panel of the Healthy Waterways Partnership in South East Queensland. At UQ he co-ordinated an innovative programme where students are placed in industry for a research project, and actively reflect on their learning and interact with UQ staff while in industry. In 2008 he was nominated for a University Teaching Excellence Award for his efforts on this programme. My research focus is on spray drying, especially of sticky or potentially sticky foods. With key collaborators (Prof. Bhesh Bhandari, UQ, A.Prof Benu Adhikari University of Ballarat) we have developed rules and understanding of the role of sugars, proteins and other additives on the drying of sugar rich foods, including fruit juices, honey and milk products. My general interests are in the modelling and physical aspects of these systems. Education Research: The role of Work Integrated Learning in the BE and ME programmes. This research project is part of a larger Coastal Co-operative Research Centre project on the interface between modelling, monitoring and management in coastal waterways. Monitoring is essential for determining the water quality and ecosystem health of waterways. However, the are significant constraints on the design and operation of these programs due to cost and resource limitations. Furthermore, there are minimum requirements on the amount of data that is necessary to provide statistical confidence. This research project will aim to overcome some of these limitations by investigating the use of simple models for the design and interpretation of water quality monitoring data. Funds are available to top-up an APA or other scholarship by up to $5000 p.a. Importantly, the successful student will have an operating budget of up to $5000 p.a. and similar support for professional development, (to June 2006). The project involves close collaboration with the Queensland Environmental Protection Agency as well as a range of other stakeholders. Students will need an honours degree in a suitable field (Science, Engineering) and an interest in modelling and water quality issues. We presently have apparatus which blows hot, dry air over a single droplet, and we obtain the drying kinetics of the drying through computer measurements of the droplet temperature and weight. We have a project which looks at improving the control of the in-coming air stream temperature and humidity, which at present is manually set by the user and monitored. In particular, we would like to look at using the data acquisition card and software in the computer to control the heating and humid air flow rates in order to perform this control. The project would suit a student interested in control or data acquisition. Howes, T. (2005). Sediments. In Eva G Abal, Stuart e Bunn and William C Dennison (Ed. ), Healthy waterways, healthy catchments: making the connection in south east Queensland, Australia (pp. 70-91) Brisbane, Queensland, Australia: Moreton Bay Waterways and Catchments Partnership. Howes, Tony, Lemckert, Charles and Moss, Andrew (2002) Long term monitoring of estuarine water quality: Brisbane River turbidity. Water, 29 6: 37-39. Howes, T., Lemckert, C. and Moss, A. (2002) Long term monitoring of estuarine water quality: Brisbane River Turbidity. Water, 29 6: 37-46. Rashid, Abdur, Marziano, Ivan, White, Ted, Howes, Tony, Litster, Jim and Liu, Lian X. (2011). Effect of high shear wet milling (HSWM) of recrystallized ibuprofen particles on its flow properties for solid dosage pharmaceutical formulation. In: Chemeca 2011 Proceedings. Chemeca 2011: Australasian Conference on Chemical Engineering, Sydney, Australia, (1-10). 18-21 September 2011. Liu, Lian X., Marziano, I, Bentham, A.C, Litster, J.D., White, E.T. and Howes, T. (2011). Influence of particle size on the direct compression of ibuprofen and its binary mixtures. In: Particulate Processes in the Pharmaceutical Industry III. Particulate Processes in the Pharmaceutical Industry III, An ECI Conference Series, Gold Coast, QLD, Australia, (). 24-29 July 2011. Rashid, A., White, E. T., Howes, T,, Litster, J. D. and Marziano, I. (2011). Nucleation kinetics for ibuprofen crystals grown from aqueous ethanol. In: Chemeca 2011 Proceedings. Chemeca 2011 Australasian Conference on Chemical Engineering, Sydney, Australia, (1-9). 18-21 September 2011. Rashid, Abdur, White, Ted, Howes, Tony, Litster, J. D. and Marziano, I. (2010). Growth rates of ibuprofen crystals grown from ethanol. In: Chemeca2010. 40th Annual Australasian Chemical and Process Engineering Conference, Adelaide, South Australia, (). 26–29 September 2010. Liu, L. X., Marziano, I., Bentham, A. C., Litster, J. D., White, E. T. and Howes, T. (2009). Influence of Particle Size and Crystal Habit on the Direct Compression of Ibuprofen. In: CHOPS09 Proceedings. 6th International Conference for Conveying & Handling of Particulate Solids, Brisbane, Australia, (1-7). 3-7 August 2009. Rashid, A., White, E. T., Howes, T., Litster, J. D. and Marziano, I. (2009). Metastable Zone width for racemic ibuprofen in ethanol and aqueous ethanol mixtures. In: Chemeca 2009: Engineering our future. CHEMECA 2009, Perth, Australia, (1-9). 27-30 September. Liu, L. X., Marziano, I., Bentham, A. C., Litster, J. D., White, E. T. and Howes, T. (2008). Effect of particle properties on the compaction of ibuprofen powders. In: G. Jameson, Chemeca 2008: Towards a Sustainable Australasia. Chemeca 2008, Newcastle, Australia, (1154-1163). 28 September - 1 October 2008. Rashid, A., White, E.T., Howes, T., Litster, J.D. and Marziano, I. (2008). Racemic ibuprofen solubility in ethanol and aqueous ethanolic mixtures. In: Jameson, G., Chemeca 2008. Chemeca 2008, Newcastle, Australia, (1393-1401). 28 September - 1 October 2008. Van der Hoeven, M. J., Litster, J D, Howes, T, Meesters, G M H and Wildeboer, W J (2006). Influence of surface tack of food products on agglomeration in spray drying. In: Fifth World Congress on Particle Technology. Fifth World Congress on Particle Technology, Florida, USA, (1-6). 23-27 April 2006. Ramsay,, Harris, C. A., Howes, T. and Stevens, A (2005). An Integrated Water Assessment Decision Support System (IWADSS) for Government Decision Makers. In: Andre Zerger and Robert M Argent, MODSIMO5: International Congress on Modelling and Simulation Advances and Appilcations for Management and Decision Making. MODSIMO5: International Congress on Modelling and Simulation Advances and Appilcations for Management and Decision Making, University of Melbourne, Melbourne, (2387-2393). 12-15 December 2005. Harris, C. A., Ramsay, and Howes, T. (2005). Development of a decision support system for water quality managers: Concepts and Structure. In: V Kachitvichyanukul, U Purintrapiban and P Utayopas, Proceedings of the 2005 International Conference on Simulation and Modeling. The International Conference on Simulation and Modeling 2005, Nakompathom, Thailand, (395-400). 17-19 January 2005. Does Modelling Need An Image Consultant? Harris, C. A., Ramsay, and Howes, T. (2005). Does Modelling Need An Image Consultant?. In: Andre Zerger and Robert M Argent, MODSIMO5: International Congress on Modelling and Simulation Advances and Appilcations for Management and Decision Making. MODSIMO5: International Congress on Modelling and Simulation Advances and Appilcations for Management and Decision Making, University of Melbourne, Melbourne, (2797-2803). 12-15 December 2005. Neumann, L. E., Howes, T. and White, E. T. (2004) Breakage can cause mean size to increase. Developments in Chemical Engineering and Mineral Processing: Australasian Research Journal, 12 3/4: 393-402. Hardin, M. T., Howes, T. and Papantoniou, M. (2003). Cold and Motivational - A Heat Transfer Modelling Project. In: D. Nguyen, P. Ashman, K. Quast and N. Swain, CHEMECA 2003 The 31st Australasian Chemical Engineering Conference Products and Processes for the 21st Century. CHEMCA 2003 Products and Processes for the 21st Century, Adelaide, South Australia, (1-5). 28 September - 1 October 2003. Howes, T., Brannock, M. W. D. and Corre, G. (2003). Development of simplified flow models from CFD simulations. In: P Schwarz, Third International Conference on CFD in the Minerals and Process Industries. Third International Conference on CFD in the Minerals and Pros, CSIRO, (1-6). 10-12 December 2003. He, Y., Howes, T. and Litster, J. D. (2003). The use of polymeric stabilisers in the control of particle size and morphology in suspension polymerization. In: The Institution of Engineers and Australia, 31st Australasian Chemical Engineering Conference CHEMECA 2003. 31st Australasian Chemical Engineering Conference CHEMECA 2003, Adelaide, Australia, (1-8). 28 September - 1 October 2003. Neumann, L., White, E. T. and Howes, T. (2003). What does a mean size mean. In: The Institution of Engineers and Australia, 31st Australasian Chemical Engineering Conference CHEMECA 2003. 31st Australasian Chemical Engineering Conference CHEMECA 2003, Adelaide, Australia, (1-6). 28 September - 1 October 2003. What does a mean size mean? Neumann, L., White, E.T. and Howes, T. (2003). What does a mean size mean?. In: AIChE 2003 Annual Meeting Conference Proceedings. American Institute of Chemical Engineers (AIChE) Annual Meeting 2003, San Francisco, CA, USA, (). 16 - 21 November 2003. Brannock, M. W. D., Howes, T., Johns, M. R., De Clercq, B. and Keller, J. (2002). CFD Modelling of Particle Transport and Biological Reactions in a Mixed Wastewater Treatment Vessel. In: H.P. Lee and K. Kumar, Proceedings of the International Conference of Scientific and Engineering Computation (IC-SEC) 2002. Proceedings of the Int'l Conf. of Scientific & Eng. Comp., Singapore, (167-170). 3-5 December. He, Y., Howes, T. and Litster, J. D. (2002). Dynamic Interfacial Tension of Aqueous Solutions of PVAAs and its Role in Liquid-Liquid Dispersion Stabilisation. In: K.N. Marsh, 9th APPChE Congress and Chemeca 2002. 9th APPChe Congress and Chemeca 2002, Christchurch, (). 29 September - 3 October. Rutgers, R. P. G., Howes, T. and Litster, J. D. (2001). Product Design and Engineering at The University of Queensland. In: Refocusing Chemical Engineering. Refocusing Chemical Engineering, Barga, Italy, (). 27 May - 1 June. Nelson, G., Ni, X., Johnstone, J. C. and Howes, T. (2000). Droplet Breakage Behaviour in a Pilot Oscillatory Baffled Column. In: Professor Dong-ke Zang, 28th Australasian Chemical Engineering Conference (CHEMECA 2000). CHEMECA 2000, Perth, W.A., (419-424). 9-12 July 2000. Nopharatana, M., Mitchell, D. A. and Howes, T. (1999). Modelling fungal growth on solid substrate with a soluble carbon source. In: The 5th Asia-Pacific Biochemical Engineering Conference 1999 and The 11th Annual Meeting of the Thai Society for Biotechnology. APBioChEC '99, Phuket, Thailand, (P-BP4). 15-18 November 1999. Cheong, B. S. and Howes, T. (1999). The controlled break-up of gravity affected liquid jets into particle drops. In: Control of Particulate Processes VI. 6th Engineering Foundation Conference on Control of Particulate Processes, Kingfisher Bay Resort, Fraser Island, (x-x). 19-24 Sep 1999.